Keepod Africa: Computing access for all? Access to computers in Africa is a challenge despite connectivity on the continent growing in leaps and bounds. Smartphones have been able to bridge the gap, however poorer people and those residing in rural areas are still finding it a bit hard to get on the internet. For a long time, cyber cafés have been the first contact for most people using computers. Yet one big disadvantage is that users cannot save their documents on these machines and they could also pose a security threat for their online accounts. Several initiatives that have tried to solve the issue of privacy on shared computers have cropped up in the past. Services such as LiveUSB, allows users to boot computers from an operating system embedded in a USB stick, enabling individual privacy and a level of security. Now Keepod, an American company, is aiming to bring computers closer to those who cannot afford them. The project uses a US$7 USB stick that hosts an operating system. Users who have this USB can easily plug in to any computer and have their own personal and private session. Yet Keepod is approaching its African initiative in a different way. The company not only provides the USB sticks at a cheaper price but also helps communities build up a computer centre using old recycled computers. Keepod also opted to use Android as Linux has some limitations for users. “OS on a stick has been used by geeks for a long time now and any Linux distribution and even Windows have a USB version. Linux didn't deliver. We want to provide a first class OS with access to first class applications. It needs to be simple, intuitive and powerful,” Nissan Bahar who is the co-founder at Keepod, said. Bahar says that it is cheaper to use an old computer with Keepod and give access to thousands than following the traditional path of having subsidised computers which are still out of reach for many in Africa. According to Bahar, the company is already experiencing success with the program. “We began with a cautious launch to gauge the reaction to Keepod and the response has been overwhelming,” he told IDG Connect. “So far Keepod itself has launched projects in Kenya, Cameroon, Congo and Nigeria. In addition to this, we have provided thousands of Keepods to NGOs which are distributing them in their own projects around the continent. Additional teams are focused on projects in Latin America, the Middle East and Asia,” Bahar added. “In a couple of months we had already shipped out thousands of Keepods and the demand is currently higher than the supply which is an exciting situation to be in. Our plan for 2015 is big, with many NGOs and Keepod Points resellers already lining up to work with us and launch their own project,” he added. Early last year the project launched in Mathare, a slum area in Nairobi, Kenya and had a huge success that drew international media attention. Keepod has seen the establishment of a computer centre where users can come in and log on to their accounts using the USB. The project in Mathare is estimated to have reached 1,500 users and cost the company over US$40,000, which it raised on Indiegogo. The company was attracted to the area due to local children’s needs. There were no good learning centres in the slum and the children had to sit for exams that were beyond what they had learnt. To give these students access to information via affordable technology was one way. “It's inspiring to see the instant effects that Keepod has on a community. For example, take the users at the WhyNot Junior Academy in Mathare. Within hours of setting up the Keepod-ready computers, they intuitively began to send emails, research countries for their geography lesson and use the apps to absorb information on so many topics that their school books just couldn't provide them,” Bahar said. The project is now looking to launch in various other cities across the continent and in other continents where access to computers is a challenge. Not everyone can have their own computer. But the need to connect is visibly growing. Companies such as Keepod can help those in disadvantaged areas to access government services which are being digitised by the day. Education is an important sector that such a technology can assist. 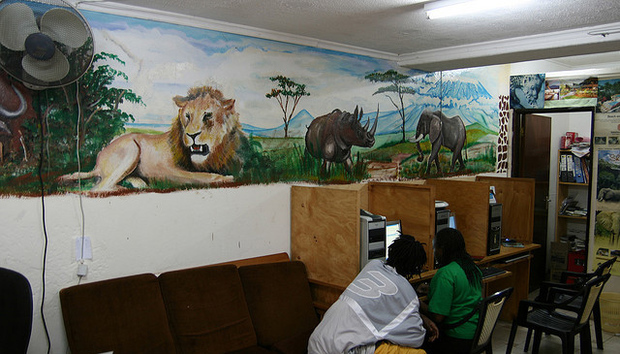 Rather than dumping old computers, individuals or NGO’s can donate them to community centres, thus solving the recycling issue and helping young users get access to information.